Tindouf (Berber: Tinduf, Arabic: تندوف‎) is the main town, and a commune in Tindouf Province, Algeria, close to the Mauritanian, Western Saharan and Moroccan borders.The commune has population of around 160,000 but the census and population estimates do not count the Sahrawi refugees making the population as of the 2008 census 45,966, up from 25,266 in 1998, and an annual population growth rate of 6.3%. The region is considered of strategic significance. It houses Algerian military bases and an airport with regular flights to Algiers as well as to other domestic destinations. 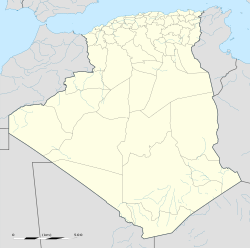 The settlement of Garet Djebilet lies within the municipal territory of Tindouf near the border with Mauritania; the settlement has an iron mine and a defunct airport, and is approximately 70 kilometres (43 mi) northwest of Âouinet Bel Egrâ. Since 1975, it also contains several Sahrawi refugee camps operated by the Polisario Front, a national liberation movement seeking the self-determination of Western Sahara. The town of Tindouf was built near an isolated Saharan oasis in 1852 by members of the Tajakant tribe, but sacked and destroyed by the Reguibat, another Sahrawi tribe in 1895, and the Tajakant tribe were expelled from the region. It remained deserted until French troops arrived in the area in 1934. Since Algerian independence in 1962, the town has been deliberately built up, partly because of its importance as a last outpost before the Moroccan, Sahrawi and Mauritanian borders. Tindouf has a population of 47,965 (2010 estimates), though this figure is of questionable authenticity, given the fact that the exact number is a sensitive issue due to the Sahrawi refugees, who are excluded from the estimate. Tindouf has a hot desert climate (Köppen climate classification BWh), with extremely hot summers and very warm winters. There is very little rain for most of the year, generally concentrated in February and —associated with the West African Monsoon— by September–October. The region can be hit by rare events of heavy rain, such as in February 2006 or October 2015. Summer daytime temperatures commonly approach 45 °C (113 °F) with blazing sunshine, while winter nighttime temperatures can sometimes drop to 5 °C (41 °F) or less. 6.1% of the population has a tertiary education, and another 18.8% has completed secondary education. The overall literacy rate is 75.0%, and is 79.7% among males and 70.1% among females. ^ a b Wilaya de Tindouf : répartition de la population résidente des ménages ordinaires et collectifs, selon la commune de résidence et la dispersion (2008 Census, ONS). ^ a b "Population: Béchar Wilaya" (PDF) (in French). Office National des Statistiques Algérie. Retrieved 10 May 2013. ^ "Algeria Communes". Statoids. Retrieved 5 May 2013. ^ "Tindouf Airport". OurAirports. Retrieved 10 May 2013. ^ "WFP assists Sahrawi refugees hit by torrential rains". World Food Programme. 2006-02-16. ^ "moyennes 1981/2010". Meteo-Climate-Bz. Retrieved 16 February 2016. ^ "Structure relative de la population résidente des ménages ordinaires et collectifs âgée de 6 ans et plus selon le niveau d'instruction et la commune de résidence" (PDF) (in French). Office National des Statistiques Algérie. Retrieved 10 May 2013. ^ "Taux d'analphabétisme et taux d'alphabétisation de la population âgée de 15 ans et plus, selon le sexe et la commune de résidence" (PDF) (in French). Office National des Statistiques Algérie. Retrieved 10 May 2013. ^ "Décret n° 84-365, fixant la composition, la consistance et les limites territoriale des communes. Wilaya d'El Oued" (PDF) (in French). Journal officiel de la République Algérienne. 19 December 1984. p. 1562. Archived from the original (PDF) on 2 March 2013. Retrieved 2 March 2013.